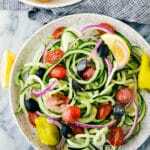 A super simple cucumber salad with spiralized cucumbers, tons of veggies, and an easy Olive Garden copycat dressing. And it’s finally here! Recipe #1 of the many “spiralized” recipes I’ll be sharing over the next couple of months. ? I held off forever from getting a spiralizer, because I thought it was just another kitchen gadget that I didn’t need and wouldn’t use all that much. BUT — I couldn’t have been more wrong; this spiralizer has been used no short of a twenty-five times already. 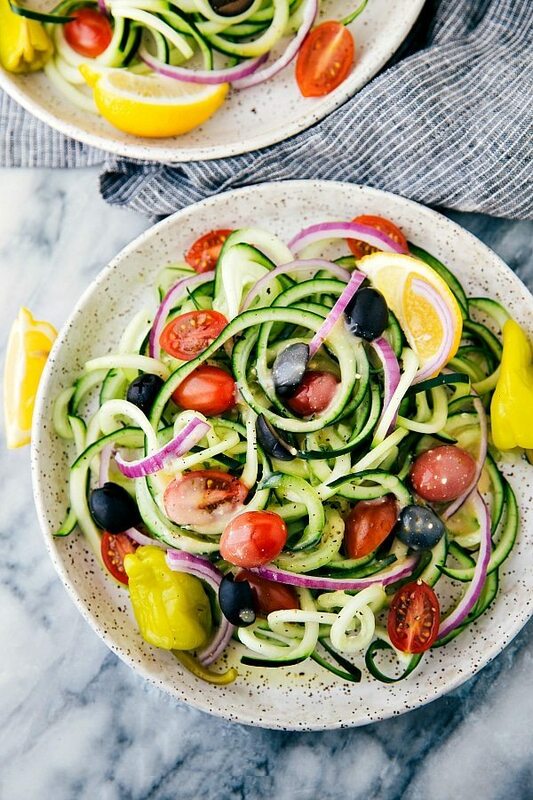 I’ve spiralized just about every single vegetable in sight and bought vegetables I usually don’t even buy just to give them a try in the spiralizer. This spiralized cucumber salad is much easier (or maybe just much more fun?) to prepare than a regular cucumber salad. 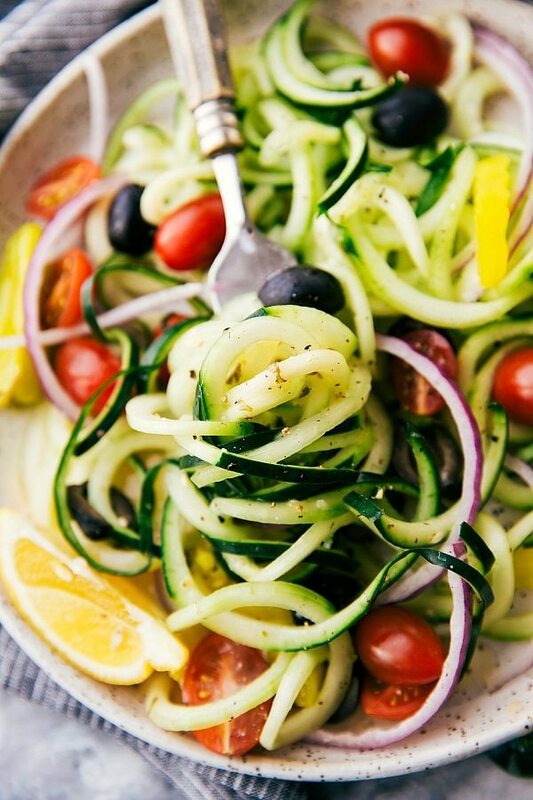 The spiralizer takes a few seconds to transform a cucumber into “salad noodles” and then you just throw in a few vegetables and voila! Dinner salad ready ?? The dressing is pretty easy too. It’s another quick blender dressing that takes a few minutes to whip together. The Parmesan cheese you use with this salad can “make or break it” so use good and freshly grated Parmesan cheese. It’s also important to say right now that this dressing is quite salty! Between the salty flavor of Parmesan cheese and the saltniess of Italian dressing mix, it is strong. We love it and totally embrace the saltiness with all the veggies (I always DOUSE cucumber in tons of sea salt), but if you are sensitive to salt you may want to try a different dressing or greatly reduce the amount of Italian dressing mix. Instead of using the dressing mix you could also just add some garlic powder + Italian seasoning + some dried parsley and you’ll have a pretty great dressing. And a final alternative is bottled dressing you can find at the store. I’ve seen “Olive Garden” dressings (light and full-fat versions) at a few grocery stores. A few months ago I grabbed a light Olive Garden dressing just to give it a try and it’s AMAZING. Top the salad with dressing only RIGHT before enjoying and make sure to only make as much as you are going to eat. Unfortunately leftovers with this one aren’t good at all. 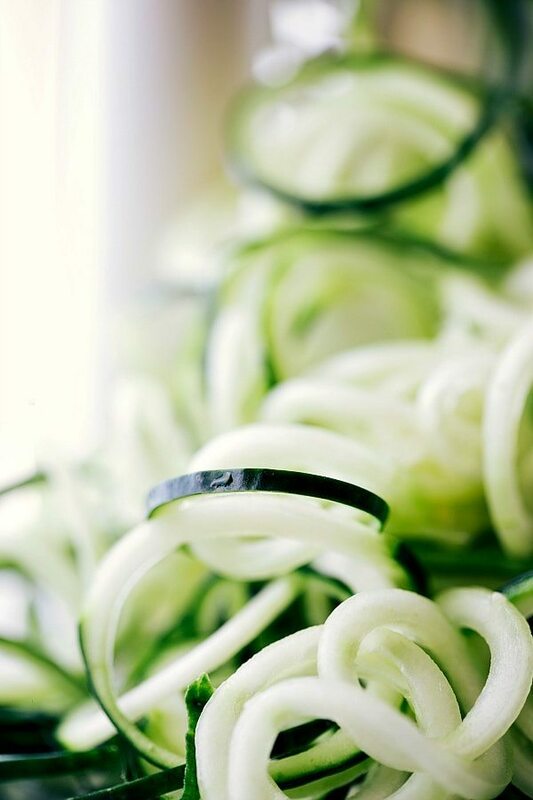 Spiralize the cucumber or slice into thin rounds if you don't have a spiralizer. Halve the cherry tomatoes and slice the olives. Thinly slice the red onion and chop the avocado. 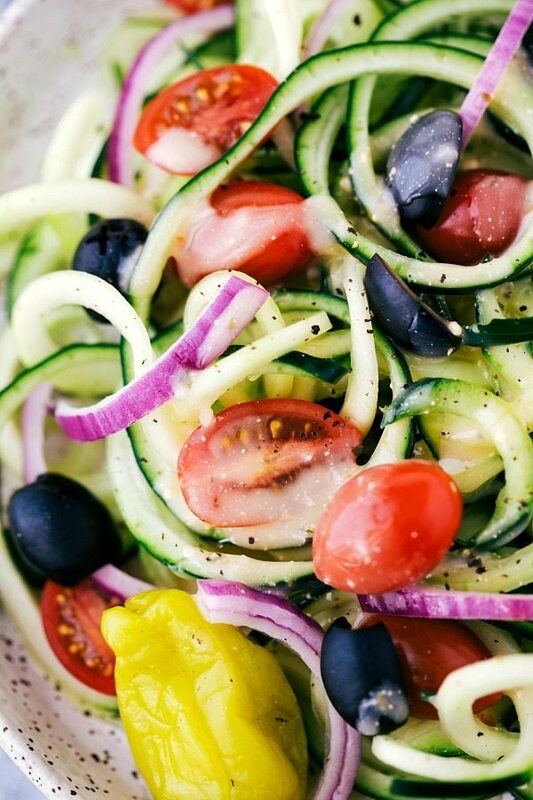 Toss the spiralized cucumber with the tomatoes, olives, onion, avocado, banana peppers, and pepperoncinis if desired. Squeeze fresh lemon over salad. For the dressing: combine all the ingredients in the blender (start with only 1/3 the packet of Italian dressing mix) and blend until completely smooth. Taste and add the dressing mix to personal preference. (We like the whole packet but it is quite salty!) Add a generous pinch of sugar if desired and freshly cracked pepper. Toss the salad with the dressing & freshly grated Parmesan cheese and enjoy immediately. Only top the salad with dressing right before enjoying. *The dressing mix makes the dressing quite salty. If you are concerned about that add just 1/2 to 1 teaspoon Italian seasoning, some garlic powder (1/4 tsp), and dried parsley (1/4 tsp.) instead of the dressing mix. I LOVE olive garden dressing, and it looks so good putting it on the zoodles. Mmm!